1. 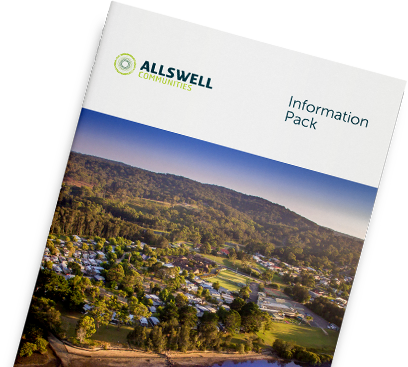 Why should I choose an Allswell Community? Choosing an Allswell Community as your place to call home, means choosing a life with more peace of mind, amongst like-minded people. We care for and manage the things you’d rather not have to worry about, so you can concentrate on enjoying yourself. 2. Do I own my home? Yes, you own your home and lease the land. 3. Are the Allswell Communities pet friendly? Our communities all operate under different rules and legislations so please refer to your community manager for a set of the site specific park rules. 4. Can I have visitors/family and friends stay with me? Yes, your guests are welcome to enjoy the facilities and activities. For longer stay guests, consent from the community management must be obtained. 5. Is there boat/caravan storage available? In many of our communities there is storage available for your boat, caravan or motorhome for a nominal annual storage fee. There are no body corporate charges, council rates and no entry or exit fees*. General maintenance is included in your lease payments. We have onsite managers who look after the village operations and the maintenance of the community facilities and gardens. *Federation Village Communities operate under a Deferred Management Fee structure. Please refer to question 17 for further clarification. 7. Will the site fees increase? Yes, the site fees are adjusted annually as per therelevant site agreement for each community. These fees are paid weekly, fortnightly or monthly by direct debit from your bank account. 8. How do I know if I am entitled to Commonwealth Rent Assistance? If you receive a pension payment you may be eligible for additional rental assistance support from the government. For full information about government subsidies refer to www.humanservices.gov.au/rentassistance. 9. Do I pay stamp duty when I purchase? 10. Do I pay a legal fee? You may consult a solicitor or refer to the section of the Fair Trading Booklet. 11. How secure is my tenure? Your tenure is secured by a site agreement which is similar to a lease. Each state is governed by different legislation, so site agreements may vary from state to state. 12. Are there any other additional charges? The only other outgoings are your own electricity, gas, water, phone and general household running. You will be responsible for the insurance on your own home. 13. What happens if the owner/operator of the community sells the community? 14. What if I decide to sell my home? That’s completely your choice. You can list your home with us or engage your own real estate agent. Whichever you choose there’ll be no exit fees, deferred management fees, or capital gains tax to pay. * Federation Village terms and conditions vary from above. Please ask us. 15. Can I bequeath my home? Yes the home becomes part of your estate. Your beneficiaries can reside in the estate if they meet the criteria, or they may simply sell the home. 16. Where do I go for more information? A unique advantage of retirement village living is, in many cases, the ability to defer a large part of the cost until after you leave the village, which for most people is well after they have a need for significant financial resources. Our Federation Villages Communities in Glenroy, Werribee, Sunshine and Ballarat operate under a Deferred Management Fee calculated on the end Home Sale Price in accordance with the terms of your lease agreement.